Dame Nellie Melba was the stage name of—the Melba part coming from her home city of Melbourne, Australia—Helen “Nellie” Porter, a singer famous in the late 19th and early twentieth century. It was while performing at Covent Garden in London, that Nellie became acquainted with renowned French chef Escoffier known worldwide for his innovative, cooking and often considered the godfather of “haute cuisine.” He had also partnered with César Ritz and was head chef of the restaurants within the famous Ritz hotels of Paris and London. Nellie Melba was a frequent visitor to Escoffier’s restaurants while in London in the late 1890s and early 1900s. It was at this time the Escoffier created the Peach Melba. 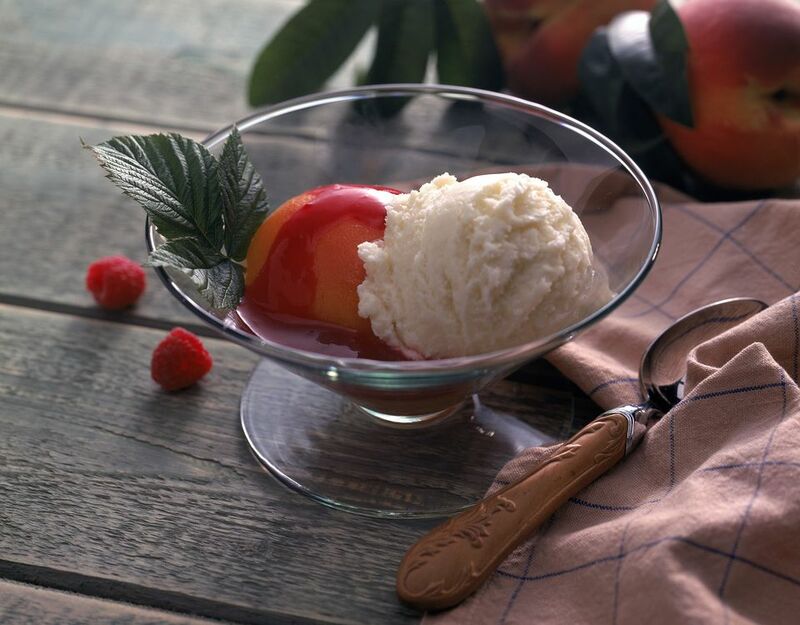 This recipe for Peches Melba (Melba peaches) uses an often neglected and little-known cooking technique called white poaching to keep the peaches firm. When white poaching, the ingredients are brought to barely a simmer and then the whole pan is removed from the heat. The hot mixture stays in the pan for a time, gently cooking in its own heat as it cools. The result is perfectly cooked, and never mushy. This is not a dish for keeping and not one to mess around with either. In this instance, the recipe should be kept to the authentic one produced by that master of Chefs Auguste Escoffier. Using a deep, wide skillet, heat 1 1/4 cups sugar and 2 cups water to boiling. After sugar dissolves, add peaches in a single layer. Reduce heat to just under simmering and poach, covered, for 5 minutes. Using tongs or a slotted spoon, gently turn all the peaches over, cover, and continue poaching for 3 minutes. Remove skillet from heat and allow peaches to sit in hot syrup for an additional 4 minutes. Stir in vanilla extract. Chill peaches in syrup for at least one hour. Push raspberries and juice from thawing, through a fine-mesh sieve, and then discard seeds and solids; set aside. Bring 1/3 cup sugar and 1/4 cup water to a boil for 2 minutes and remove from heat, stir in lemon juice and zest. Stir simple syrup (sugar mixture) into a seedless raspberry puree and chill for 30 minutes. Layer peaches and raspberries over ice cream in frosted dishes and serve.